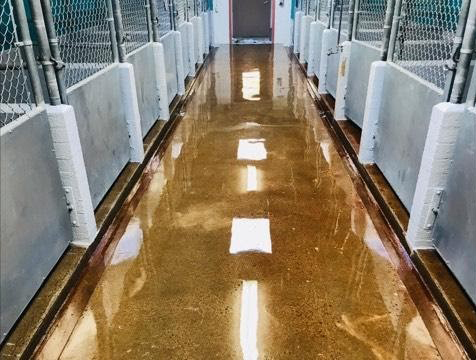 Yavapai Humane Society in Prescott, Ariz. wanted to upgrade the bare concrete floors in its 1,200 sq. 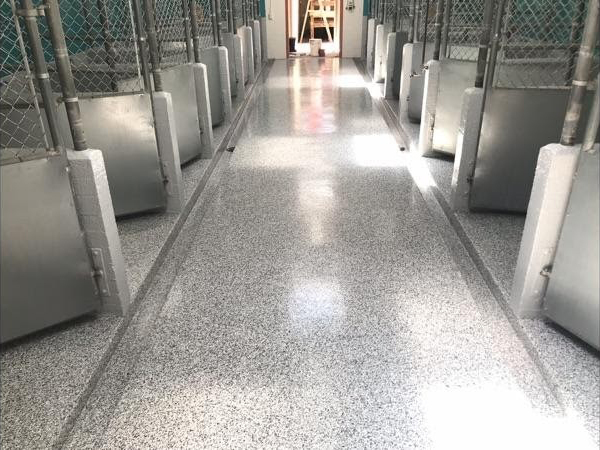 ft. kennel area with high-performance flooring that could stand up to heavy foot and animal traffic, spills, cleaning chemicals and more. B&M Painting, Inc. specializes in interior and exterior house painting, commercial painting, concrete floor coatings, stucco and drywall repairs. 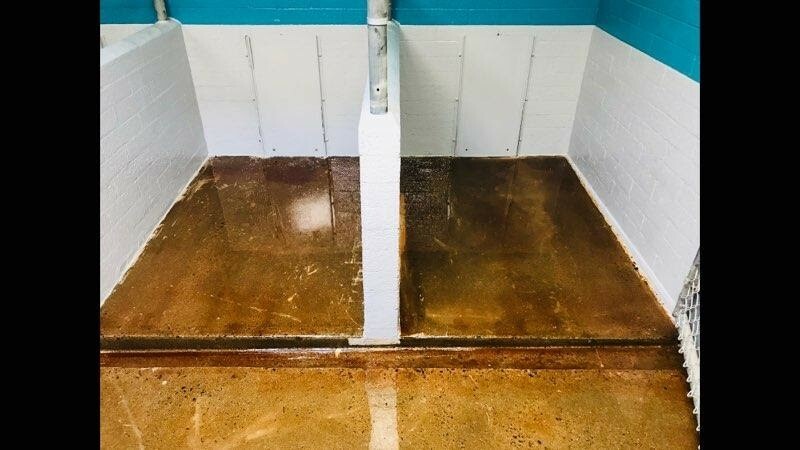 To show its support of the Yavapai Humane Society’s work in the animal community, B&M Painting volunteered to resurface the facility’s floors free of charge. Oil Stop Primer - Oil Stop Primer is a low viscosity, 100% solids resin designed for use as a primer on concrete that is contaminated with hydrocarbons, such as motor oil, solvents, cutting oils and hydraulics fluids. 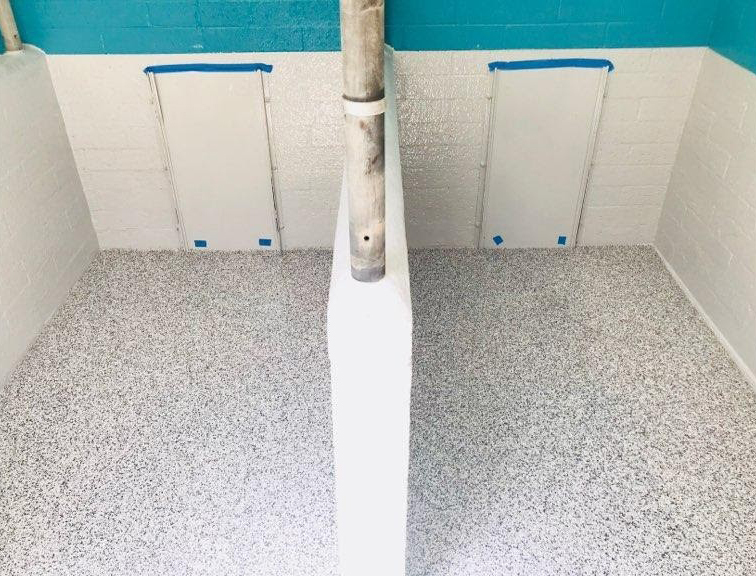 Epoxy 550 – Epoxy 500 is designed as a base coat for color chip flooring. It is formulated with unusually high pigment loading, which makes for excellent substrate hide in a one-coat application. B&M Painting used ¼ inch marble chips in this installation. Cem-Seal – Cem-Seal is a water-based acrylic emulsion used in a variety of decorative concrete applications, including color chip flooring. It is available in both clear and pigmented formulations, dries quickly, and is high in solids. Cem-Seal forms hard coating films, resists blushing, and provides excellent resistance to yellowing in exterior applications. 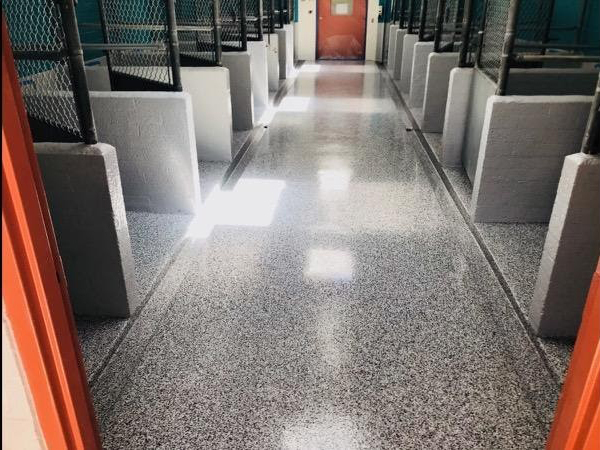 Polyurethane 100 – Polyurethane 100 is a two-component, high solids aliphatic polyurethane that is designed to be a high-performance topcoat in various protective coating and seamless flooring applications. It provides maximum cleanability and stain resistance when used as a finish coat in color chip flooring or epoxy quartz flooring. Sani-Wall™ Wall Coating – Sani-Wall provides a seamless, high-gloss, durable wall surface that is easy to clean. It is ideal for a variety of institutional and industrial applications. Epoxy 400 – Epoxy 400 is a low viscosity, 100% solids resin system used in a variety of flooring applications. This material cures blush-free and provides an outstanding balance of physical strength, flexibility and chemical resistance. To prepare the concrete for flooring installation, B&M Painting pressure washed and ground the floor. 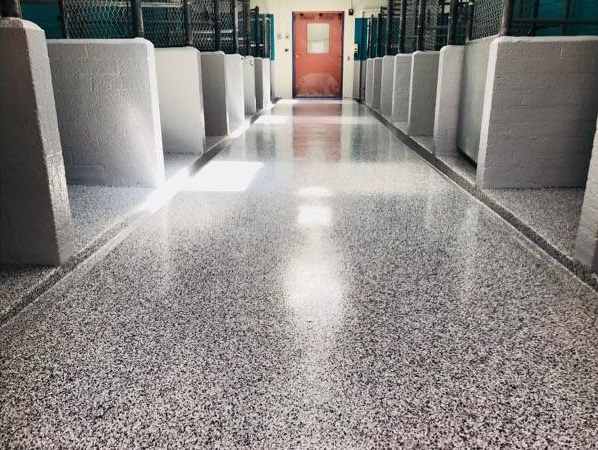 Next, they applied Oil Stop Primer to remove any contamination, and followed with a full broadcast system of Epoxy 550 with ¼ inch marble chips and Cem-Seal. They finished off the floor with a clear coat of Polyurethane 100. 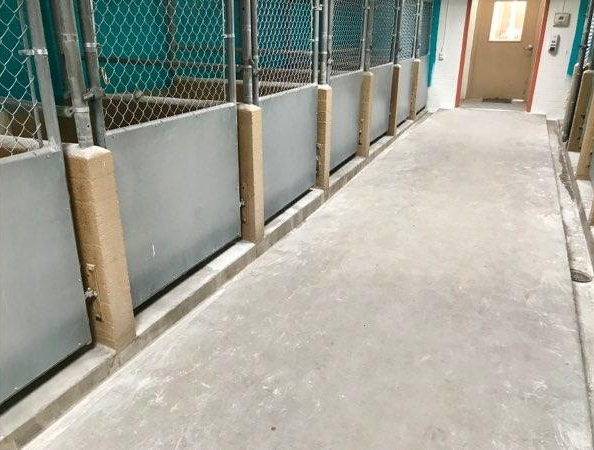 They coated the facility’s walls in Sani-Wall and Epoxy 400 to create a durable, easy-to-clean surface. B&M Painting is proud to do their part to help Yavapai Humane Society give animals a new outlook on life.